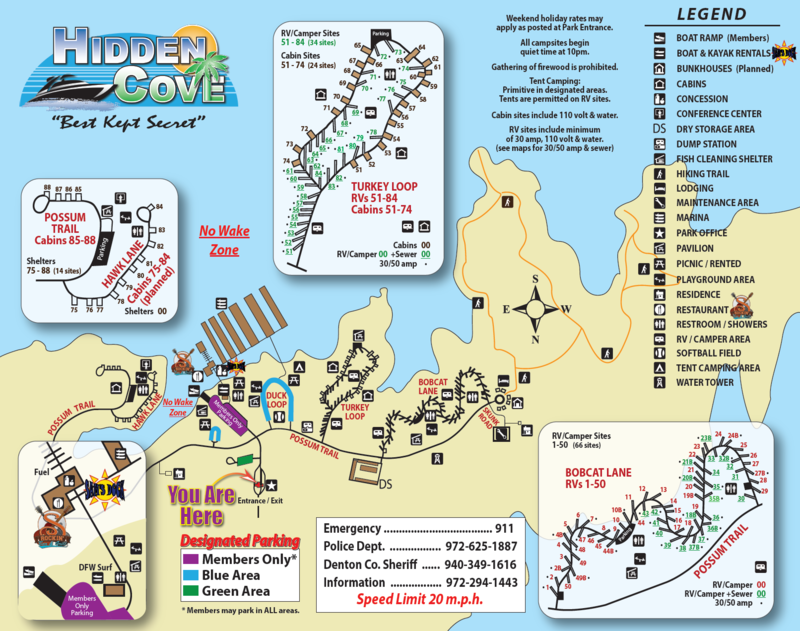 Hidden Cove Park boasts over 470 acres containing a plethora of excellent outdoor recreational opportunities such as boating, fishing, camping, hiking, skiing and so much more. A full-service marina is located on the premises along with many perfect spots for picnicking or nature watching. If you're looking for a place to eat, look no further than Rockin' S Bar and Grill! They have a plethora of different items to choose from. And enough beverages to keep you afloat during those hot summer days. If chilling on the water with your family and friends while getting a workout is your thing. Be sure to check out DFW Surf just at the top of the boat ramp! For more information on these and everything else we have to offer, check out the rest of our site. When planing your visit, please take note of the prices below along with all corresponding advisories. We look forward to seeing you soon. In-Season Hours Sunday - Tuesday 8 A.M. - 8 P.M.
In-Season Hours Wednesday - Saturday 8 A.M. - 10 P.M.
Off-Season Hours Sunday - Saturday 8 A.M. - 8 P.M. The map below can be referenced when selecting the perfect location to enjoy your trip to the lake. If you have questions, need more information, or would like to make a reservation, feel free to give us a call at 972-294-1443 or email us at [email protected]CovePark.net and one of our friendly representatives will be happy to address your needs.